Crispy topping and savory filling surrounded by sweet roasted peppers. When you’ve just received a CSA (community-supported agriculture) box containing giant beautiful peppers, what better use for them? 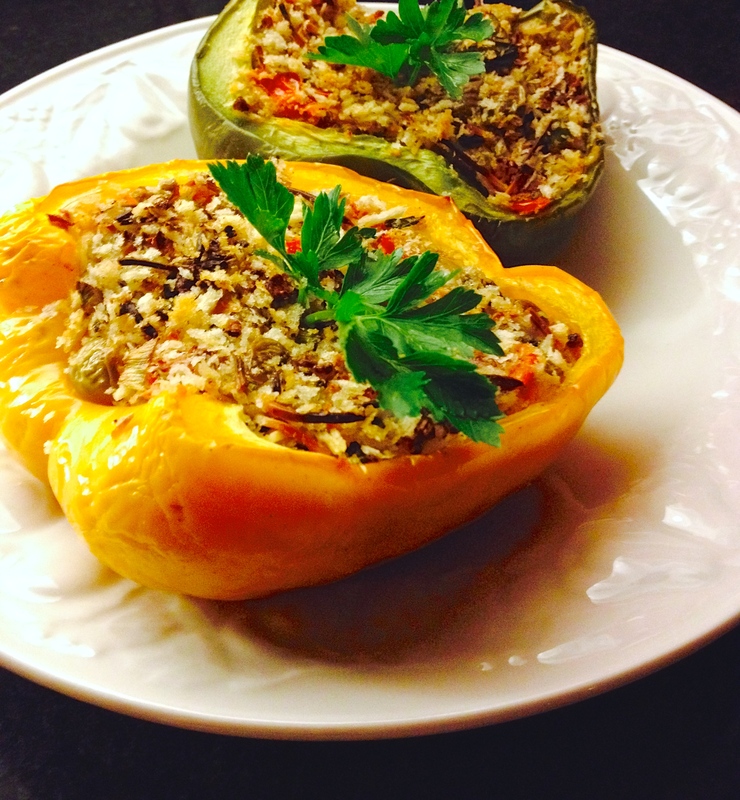 I had never stuffed a pepper before, but if I can, you can too! These are so pretty, they would be great for company. I’m becoming a huge fan of Rose Elliot, who is very well known in Britain for vegetarian cooking. Her recipes are simple yet inventive. As you may know, European recipes often put things in terms of weight, so it’s handy to have a food scale. Mine is tiny and cost $15; it is well worth the added confidence it gives. 4 oz. pitted olives, green or black (this came to about 1/2 cup) – use good ones! it’s worth it! Equipment: 8×11 casserole dish, aluminum foil for propping up the peppers, medium saute pan. Prepare the pepper shells: Preheat the oven to 350 degrees F. Spray your casserole with cooking spray. Cut each pepper in half lengthwise. Remove the stem, core, and seeds (you can also leave the stem if you like – just cut right through it. I forgot and took it out. You could probably stuff them even fuller if you leave it in.). 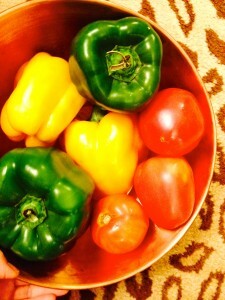 Place the pepper halves cut side up in your casserole pan. You want them to be fairly upright as they cook so if they are roly-poly, place some crumpled-up foil in the bottom of your casserole and nestle the peppers into it (spray the foil with cooking spray too). Prepare the filling: Heat the olive oil in your medium saute pan. Saute your onion over medium heat for 8-10 minutes or until softened and just starting to brown. (You need the pan to be a bit larger than your onion needs, because you’ll be adding other things to it.) Add the garlic when you’ve got about 2 minutes left and continue to saute. Remove the pan from the heat and stir in the breadcrumbs or panko, chopped tomatoes, grated cheese, olives, parsley or scallion. Add salt, pepper and Tabasco or chipotle to taste. The filling will be pretty, with flecks of red and green from the tomato and parsley/scallion. Stuff and bake the peppers: You might be thinking, How am I going to get all this stuffing into these peppers? Fear not! It is exactly the right amount, but you have to pack it in. Pick up a half pepper, add some stuffing and use the back of a small spoon to pack it in, then add more. Once the stuffing is well-packed and even, place the pepper back in the pan, and repeat for all the pepper shells. Once you’re done, admire how awesome they look. Then bake at 350 degrees for 40-45 minutes or until the top of the stuffing is crisp and golden brown and the peppers are soft. Your kitchen will smell heavenly as this is going on. Omg i have to make this!!! My mouth is watering!